An impressively large .50 inch, high powered pistol, revolver and rifle round was developed by Smith and Wesson and commercially released in 2003. This was designed primarily as a bear and bison defence round that could be used in the Smith and Wesson Model 500 revolver. The cartridge is also called .500 S&W Magnum. 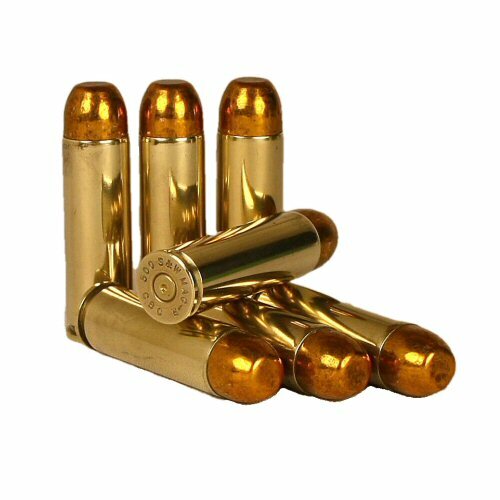 It is considered the most powerful commercial sporting handgun cartridge because of its high muzzle energy. Its high power has led to the development of lower recoil versions of the same cartridge. 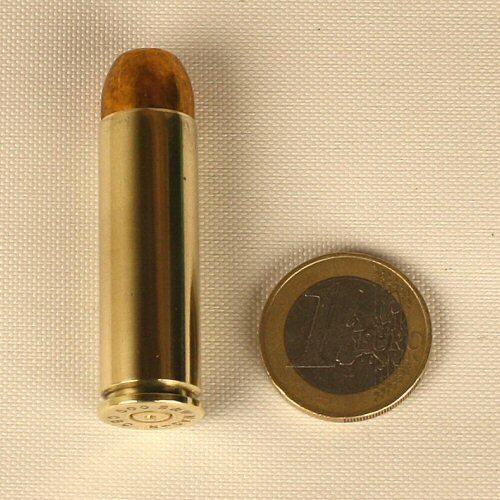 The .500 Smith and Wesson Magnum cartridge uses a .501 diameter bullet head so as not to be classified as a destructive device under the US National Firearms Act as happened to the original .50 AE cartridge. Price is for ONE round only. The round is free from explosives and ignition devices and can be sent with courier (UPS) or Hermes due to postal restrictions. The cartridge compared with a coin for size.